With Australia Day fast approaching and with it the annual airing of the AX prefix, I thought a celebratory SOTA expedition would be in order. Initially I’d been considering the as-yet unactivated summits in the Woomargama National Park, but a bush fire burning on the northern borders of the park put paid to that. For the moment, anyway, but that’s another story. There are other VK2 summits reasonably close to home but most of them are either hard to access, on private land, low points or a combination of these. So, that left a good swag of VK3 summits in easy reach, most of them easily accessible and in national parks or state forests, and a good proportion of them 6 to 10 pointers. 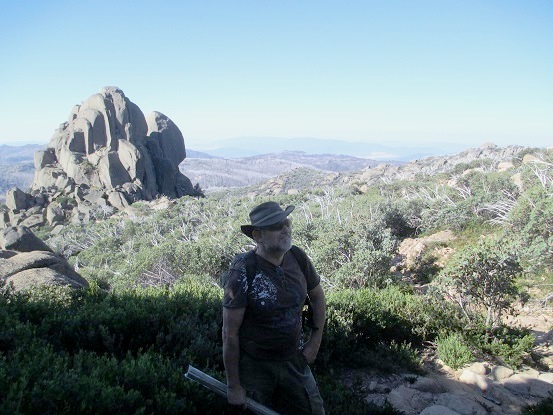 On a recent SOTA expedition to the Mount Buffalo National Park I activated The Horn but had to bypass The Hump due to lack of time and, I guess I should admit, inadequate preparation. That situation had to be remedied, and so my lady and I agreed that The Hump would be the venue for our Australia Day expedition. It occurred to me that our European chaser friends might want to work not only the Summit but also the AX prefix, and so I decided that the activation would be done late afternoon and into the evening, to give us the best chance of working EU stations. We decided that since we might be coming down off the Summit late in the evening we’d book ourselves in to a nearby motel so that we didn’t have to drive home after the walk up to the top of the hill and back. This turned out to be a great idea and we were very grateful for a hot shower and a comfortable bed on our return from the Summit. Motel booked, we set about making a plan for the day. The original idea was to set out early and spend the day exploring in and around the Mt Buffalo National Park before heading up to The Horn in the late afternoon. Sounds great, doesn’t it? We could check out Eurobin Falls, maybe take a stroll up to Rollasons Falls picnic area for a leisurely lunch, check out the hang-glider folks leaping fearlessly into space from The Gorge… Until, that is, we discovered that there was a major cycling event taking place that day that would see (the organisers claim) something like 2,000 cyclists riding up the Mt Buffalo road to Dingo Dell and back down again. Don’t get me wrong, we have nothing against cyclists and have often watched in astonished admiration as they power up a steep mountain road, but we had no desire to share the narrow, winding Mt Buffalo road with a couple of thousand of them! So, plan B was that we’d leave it until later in the day, when we were ready to head for the Summit, before making our way into the park. That turned out to be a wise decision. We passed a small number of cyclists working their way up, and we dodged more than a few heading down again at high speed. It’s a little hair-raising coming around a blind bend to be confronted with a cyclist, head down, speeding towards you on your side of the road. It’s a 60 kph speed limit up there but I reckon several of those cyclists were going faster than that. Brave, foolhardy or failed brakes – nothing else could explain it! We arrived at The Cathedral car park at about 5pm, shaken but not stirred and luckily having avoided collecting any unfortunate cyclists on the way up. It was a beautiful afternoon, not a cloud in the sky and the temperature in the high 20s – just perfect for a stroll up to The Hump. The 1.5km trail leading up from the car park is very well constructed and would be regarded as “easy” in bushwalking circles. It climbs a little over 200m over its length, and there are no very steep sections to contend with. On the way up, the trail passes close to the base of The Cathedral, which is a spectacular formation very popular with rock climbers. The final hundred metres or so close to the Summit is rather loose, with many rocks that could trip the unwary walker. “Easy” it may be, but you still need proper walking shoes for this one. I had acquired a new 8400mAh LiFePO4 battery and this expedition was to be its first outing, replacing an ageing and extremely heavy 9AH SLAB. The weight difference was quite significant, though of course I made up for it by carrying other things (including my Bencher CW keyer) and so my pack weight probably wasn’t much lighter than on previous trips. This time though I did fit everything into the one pack, all except the antenna pole which is quite light and easy to hand carry. 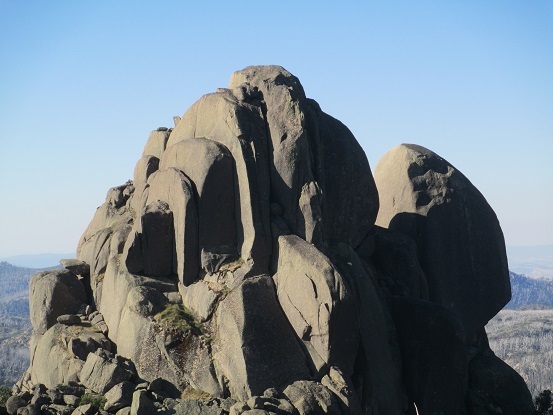 The Summit itself is made up of large boulders jumbled haphazardly together, with a few Snow Gums here and there and a covering of low, scrubby bushes growing wherever they can gain a foothold. A pole of some sort is definitely required here, as there are no trees of sufficient height to support an antenna. There are plenty of places where a pole can be rigged, and we spent a few minutes exploring the Summit checking out potential sites. 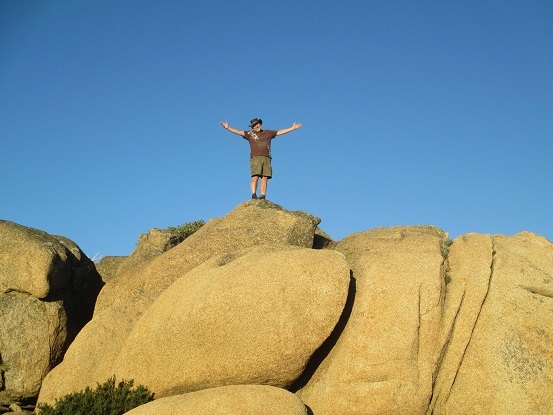 Eventually we decided on a location with a good sized rock that would double as a seat and an operating table. We put up the bendy pole, slung the link dipole from the top of it with the ends tied off into the bushes, and we were in business. I found that there is a usable 3G signal in places around the Summit, so I was able to self-spot via SOTA Goat. 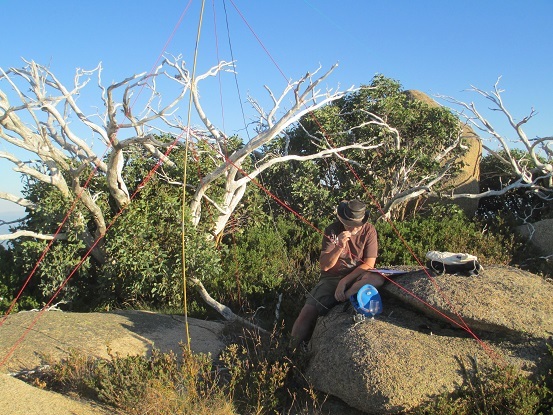 I started on 7MHz SSB where I quickly found AX2ARR on Mt Macedon for a quick S2S. The usual SOTA frequency 7.090 was full of QRM that sounded like AM CB coming from southeast Asia, so I moved a little down the band to avoid it and quickly worked VK1MDC, AX2YW, VK3FPSR, VK3FQSO, AX3MRG, VK3DET, AX5EE, AX3ANL, VK2JI and AX5PAS. When there were no further callers I popped out the 14MHz links on the dipole and went up to that band to see what was happening up there. Would it be open to EU, and if it was, would they be able to hear my 5W signal? After half an hour or so of trying, the answer to those questions, it appeared, was yes and no respectively. There was some kind of contest going on – isn’t there always on weekends – and many of the EU contesters were coming in at S9+. Among them there were a few stations patiently calling CQ DX and I had a go at several of them without success. I tried putting up a spot via SOTA Goat and then spent 15 minutes calling CQ in vain. Nobody could hear me! Ah well, never mind, I had at least completed the activation on 7MHz so I wasn’t desperate for the contacts. The sun was by this time dipping towards the western horizon and as we didn’t fancy picking our way down the trail in the dark we decided to pack up. Everything was dismantled and packed in its place within ten minutes and, after a couple of minutes casting around to find the top of the trail, we headed down. Once again we took our time, taking advantage of the amazing light to snap some more photographs. An energetic couple passed us at about the halfway point, powering their way up, determined to get to the summit, check out the view and get down again before dark. We didn’t fancy their chances; on the eastern side of the hill the daylight was already fading. We made it back to the car park with enough daylight to make ourselves a celebratory cup of tea. We sat at the picnic table there and drank it slowly, waiting to see if the energetic couple would make it back down before darkness fell. They did, but it was a close call. The drive back down was uneventful but in the dark the narrow, winding road requires full concentration. There are plenty of signs warning of the presence of wildlife including kangaroos and wombats, neither of which you really want to have a close encounter with on that kind of road. When we got back to the motel, the hot shower and the comfortable bed were as welcome as we had anticipated they would be. Beware of “easy” trails. Yes they probably are easy if you’re a fit and enthusiastic bushwalker. If you’re not then take your time and don’t bust your boiler on the way up, because you still have to get down again and going downhill is in many ways just as hard as going up. In the dark, no trail is easy.